13.3 inch All-Rounder. 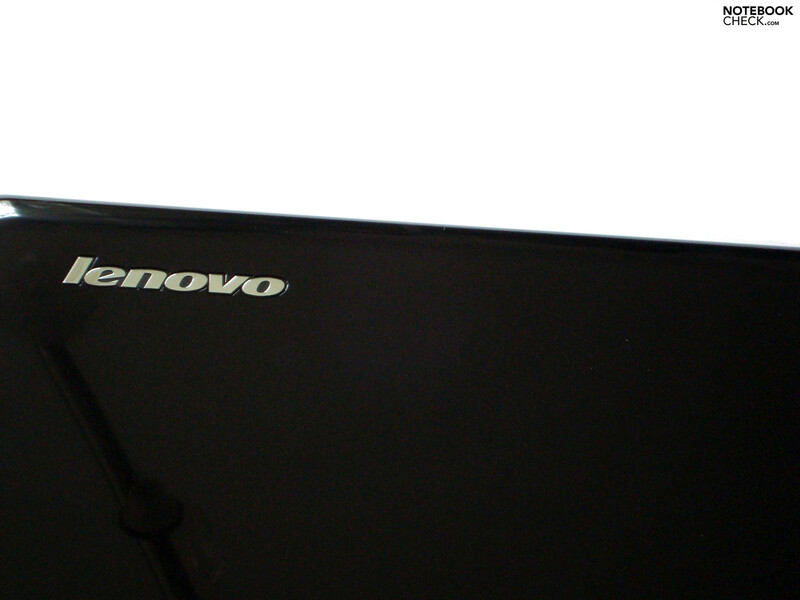 Lenovo reinforces its z Series with a representative in the 13 inch division with the Z360. The IdeaPad Z360 is small and light enough to be taken along everywhere with a weight of a bit over two kilos. Find out if it's really worth buying in the following review. Despite its low weight and size there is a lot of mobile computing performance in the 13.3 inch case, due to a Core i5 processor. The Lenovo IdeaPad Z360 is rounded off with a four GB RAM, a 500 GB sized hard disk from Hitachi and a reflective HD Vibrant View Glossy TFT display with LED backlight technology. 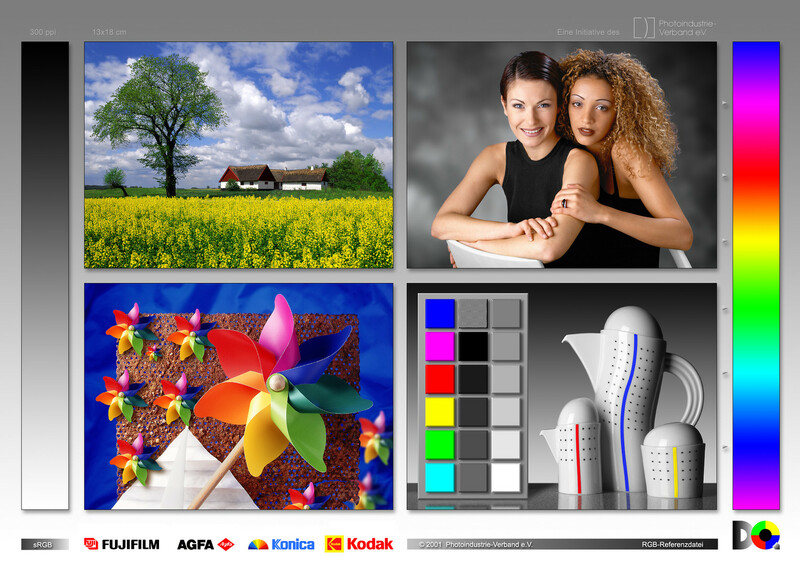 The maximum resolution is 1366x768 pixels with a widescreen aspect ratio of 16:9. Both an onboard graphics, Intel GMA HD, as well as Nvidia's Geforce 310M is used as the graphics solution (Optimus) - but more about that later. 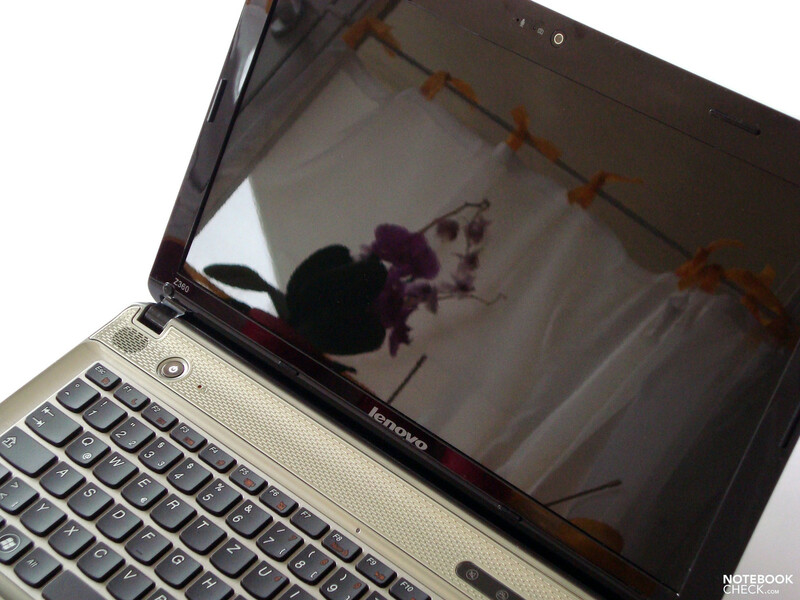 Lenovo's IdeaPad Z360 makes a very good optical impression. As in many notebooks today, our test candidate has a high-gloss display back. The display bezel is also made in a black high-gloss look. As usual, fingerprints are left very quickly and easily on these sensitive surfaces. Thus, regular care and cleaning are required to maintain the chic high-gloss looks. The wrist-rest has been given a brushed metal look and blends in very well with the overall concept. We hardly have anything to complain about in terms of stability. Merely the right wrist-rest side yields visibly under pressure. The reason for this is likely the cavity beneath the DVD drive. 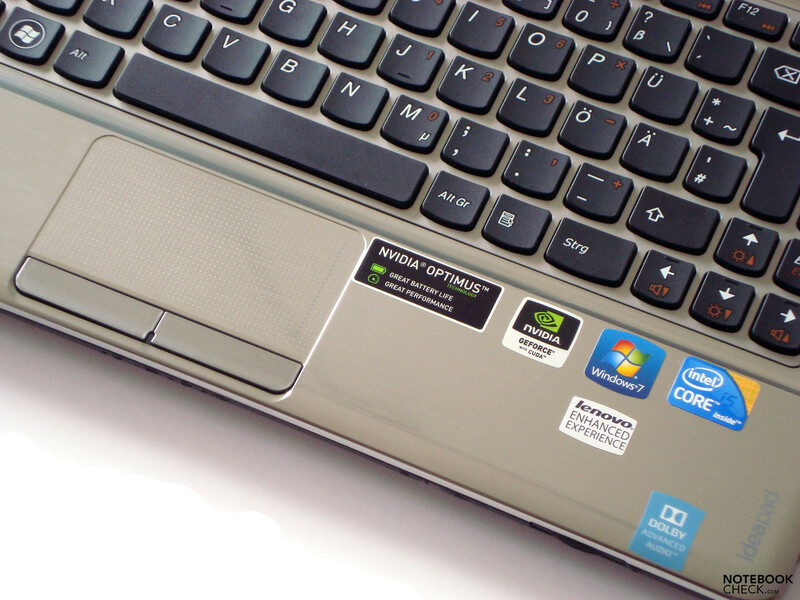 Otherwise, the IdeaPad Z360 makes a very solid and stable impression. 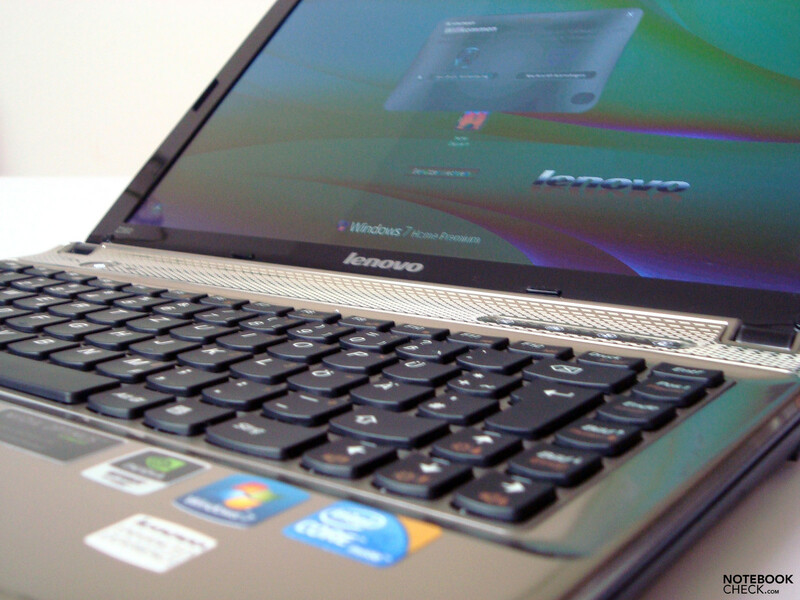 Lenovo could even convince us with the IdeaPad Z360's workmanship. The single parts have been assembled precisely so that there are no sharp edges. The 13.3 inch display is held in place with two, rather under dimensioned, hinges located on both sides. The display teeters clearly and obviously when the opening angle is altered. Opening and closing the display is easy and without disturbing noises. 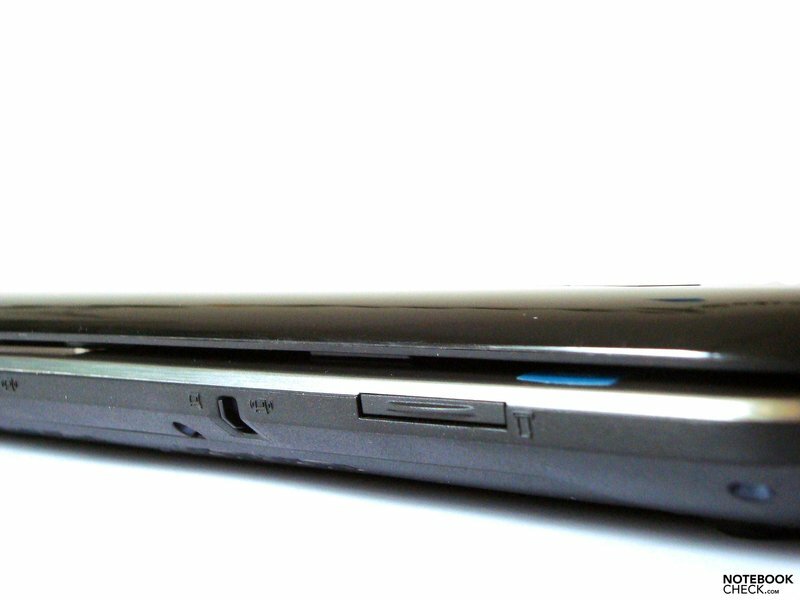 The IdeaPad Z360 doesn't have a closing mechanism. Obviously, they weren't stingy with the interfaces. 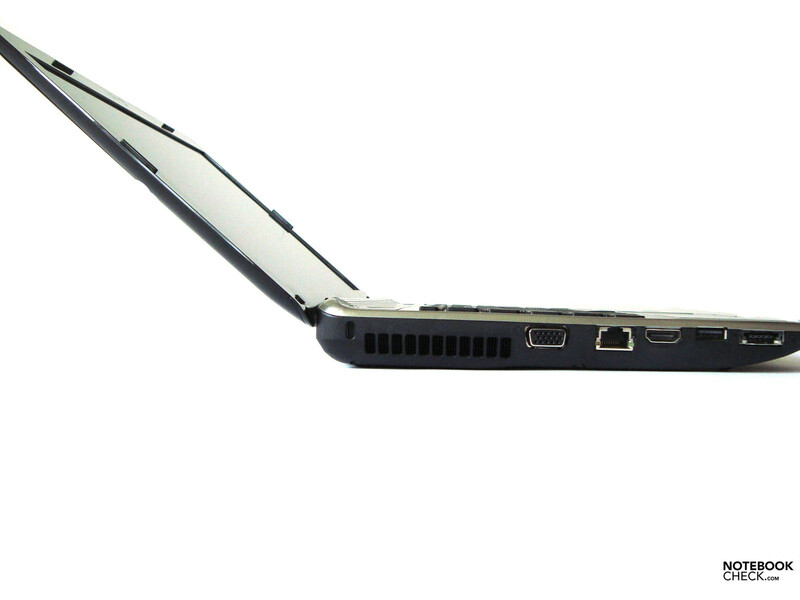 Thus, the IdeaPad Z360 shows itself from its best side in terms of interface supply. 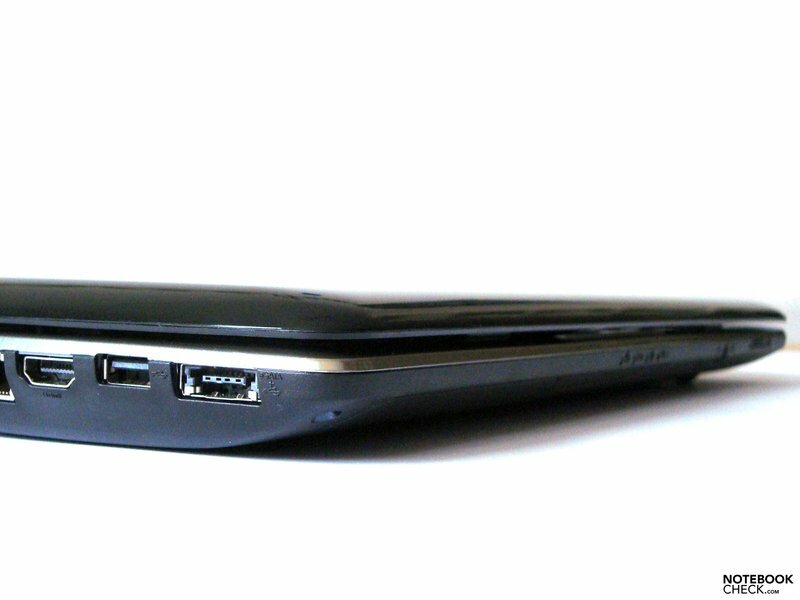 Standard ports, such as USB 2.0, audio out and in and a LAN port, are part of the team. However, there are more modern sockets, like e.g. HDMI or eSATA, found on our test device. Unfortunately, the port distribution is mainly limited to the sides. The Kensington lock, analog VGA out, LAN, HDMI, USB, USB/eSATA combo port are all found just on the left side. Thus, it looks very crowded and could have a negative effect on mouse use for lefties. In return, the right looks very well arranged because the largest part is reserved for the optical drive (Optiarc DVD RW AD-7700H) on this side. Otherwise, only both audio sockets and a USB 2.0 interface are found here. Found on the back: the battery and power socket. 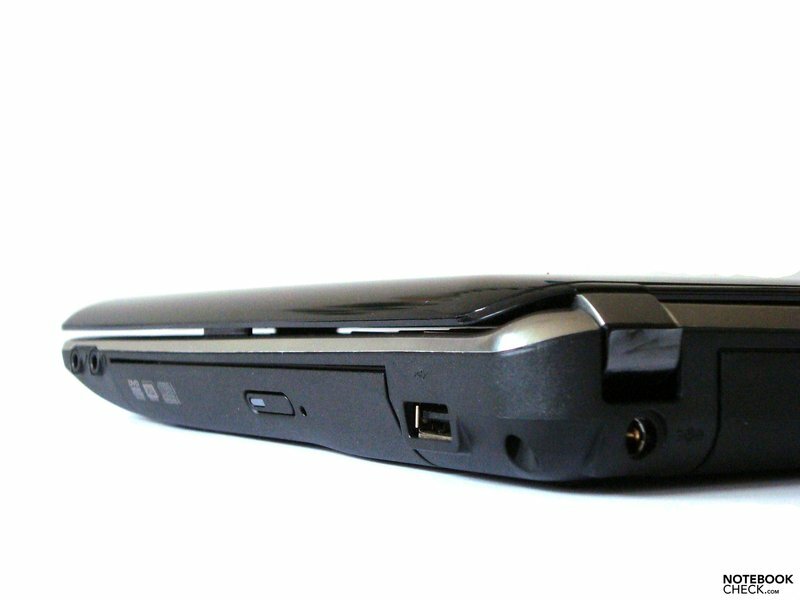 Merely the 5-in-1 cardreader is located on the front. 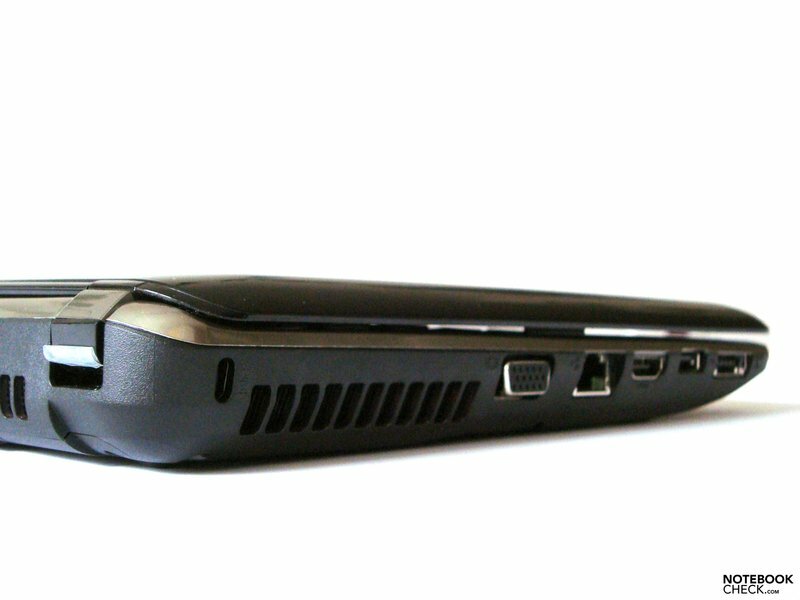 Further equipment of the IdeaPad Z360 is a webcam located in the upper display bezel region - just like its array microphone. The test device has two possibilities for communicating with networks or the internet. First, a somewhat outdated, wired variation via the LAN port (Atheros AR8152 PCI-E Fast Ethernet Controller). Secondly, a wireless variation via the installed WLAN adapter (Atheros AR9285 Wireless Network Adapter), which can be turned off and on with a mechanical slider on the front. Alternately to the slider, it's also possible to disable the WLAN module with a key combination. 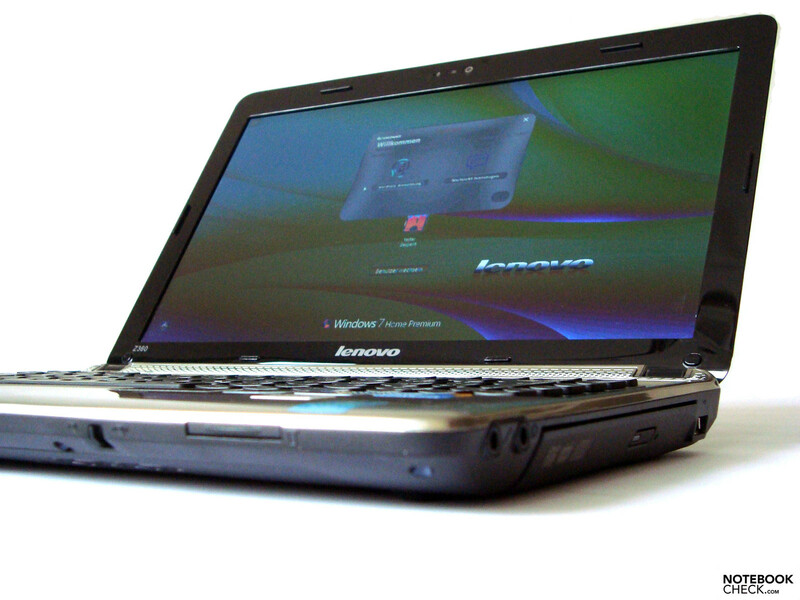 Additionally, Lenovo treats the 13.3 inch newcomer to a Bluetooth 2.1 adapter (Broadcom BCM2070 Bluetooth 2.1+EDR USB device) for communicating with small appliances, such as mobiles or Bluetooth enabled headsets. 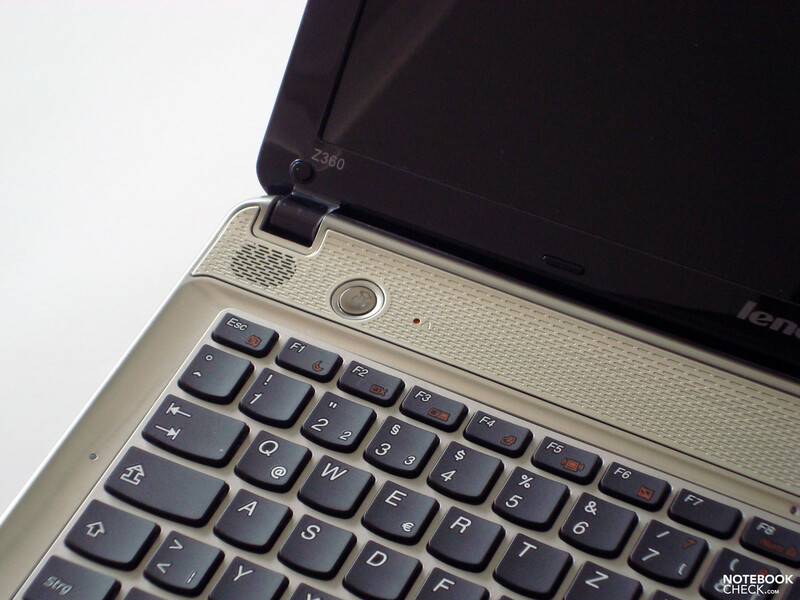 The IdeaPad Z360 has a slot for connecting a security lock, such as that from Kensington, to protect it against theft. Moreover, the subnotebook is able to restrict access to sensitive data by using Lenovo's VeriFace, a facial recognition software, and the webcam. Lenovo grants a 24 month warranty when you buy an IdeaPad Z360. Now to the IdeaPad Z360's input devices. Despite the 13 inch size and the resulting lack of space, the keyboard bids a very pleasant size for working, even if you have to type longer texts. 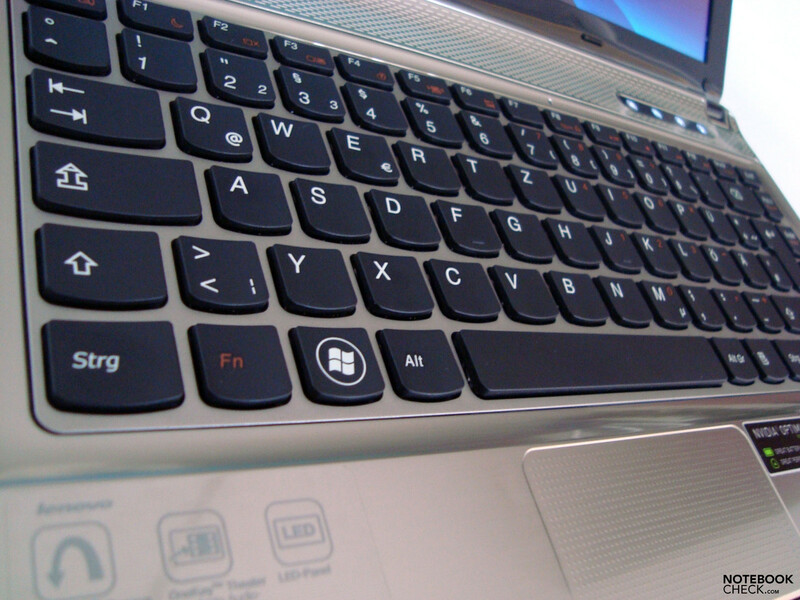 The chiclet keyboard provides a very good typing feel and could also convince us. 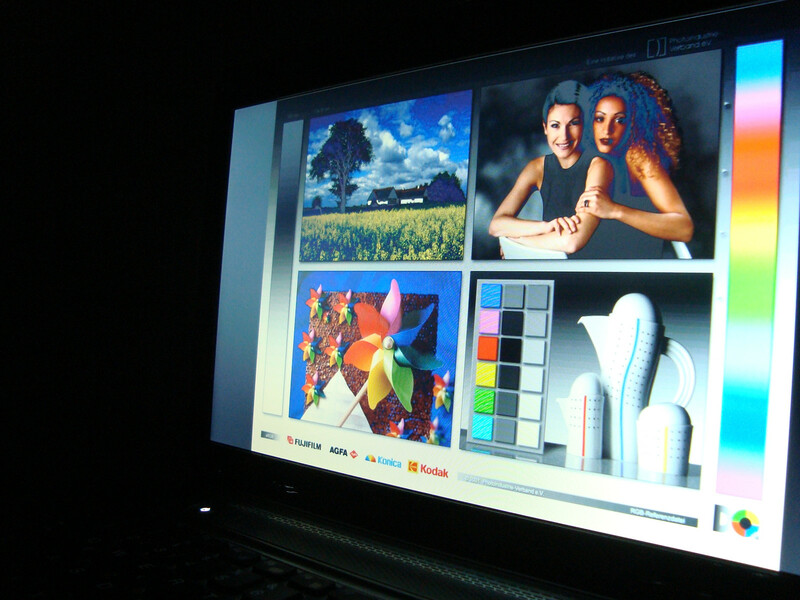 Lenovo advertises on its homepage for the Z Series with the phrase: "Best keyboard in its class". We don't know if that is really true because fortunately tastes are different. The pressure point is well palpable and the keyboard layout doesn't have to hide, either. Thus, it's possible to touch type comfortably after a short accommodation period without ado. The installed keyboard proves to be quite solid under pressure and only yields slightly. The keyboard can occasionally get a bit louder when typing vigorously. However, the noise level stays in a reasonable range. 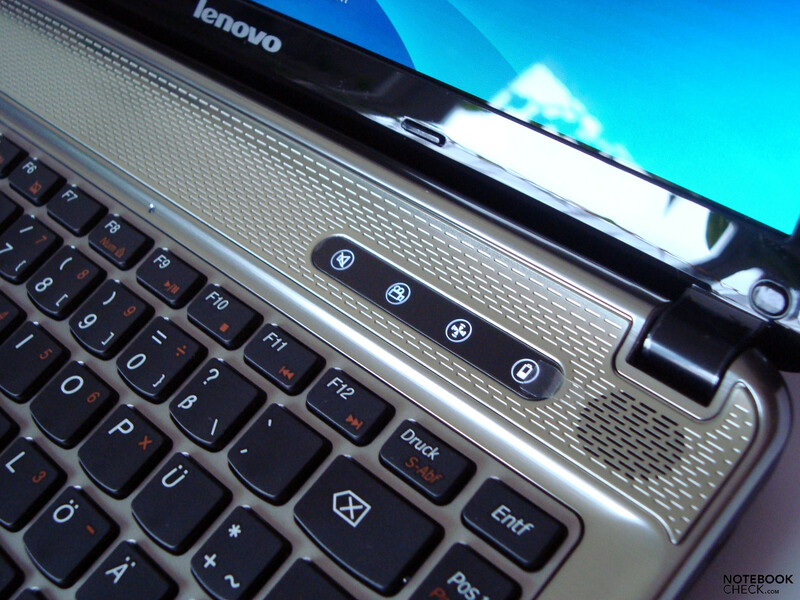 There is nothing to complain about in regards to the touchpad (Alps Pointing-Device), either. 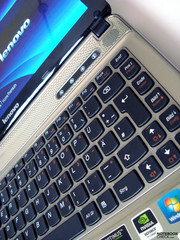 The gliding trait of the touchpad's knobbed surface is acceptable and does its work accordingly as a mouse replacement. Both mouse keys are located directly below it and have a metallic surface finish like the wrist-rest. Thus, visible fingerprints on both mouse keys are inevitable if you don't use an external mouse. The touchpad's control of our test device can be described as very exact and precise, if you don't have moist fingers. Then it can come to occasional interruptions. 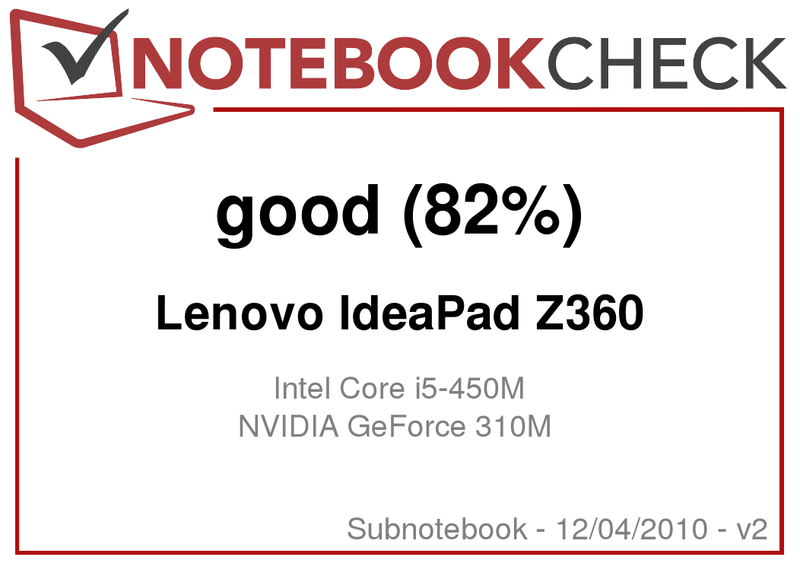 Basically, we can give the IdeaPad Z360's input devices a good grade. 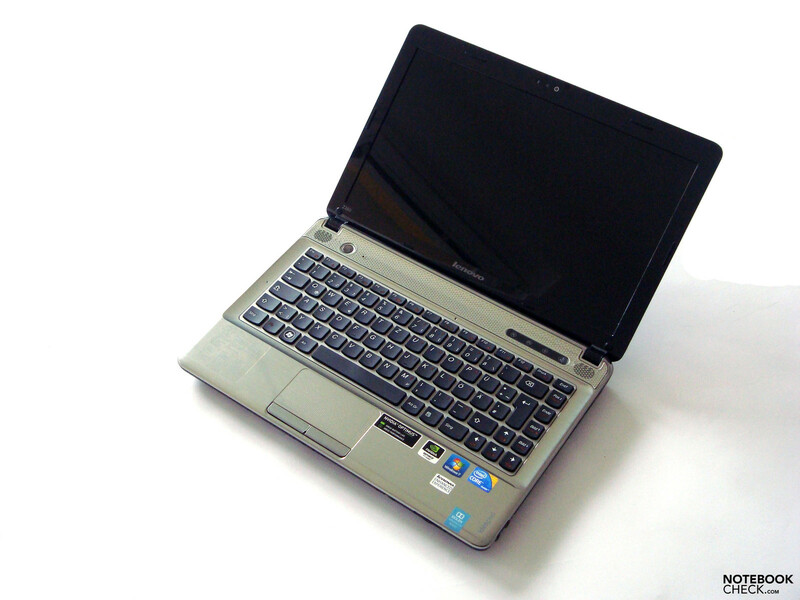 The IdeaPad Z360's 13.3 inch display has a screen diameter of 33.8 centimeters in a widescreen aspect ratio of 16:9. The maximum resolution of our test device is 1366x768 pixels, which provides for a very good overview on the actually small display. Equipped with such a screen, the IdeaPad can be called HD Ready, whose strengths are first really seen when rendering HD movies. The displayed picture is always very focused. The colors are just as impressive - at least at first sight. The IdeaPad Z360 likely also owes this fact to the display's reflective surface, as it makes colors look more vivid and saturated. However, this is paid highly with the 13.3 inch notebook's outdoor suitability. Due to the rather average display brightness, the display content is only difficult to recognize in brighter work surroundings, as it is the case outdoors for example. Light sources behind the user are just as unpleasant because they are mirrored on the screen. 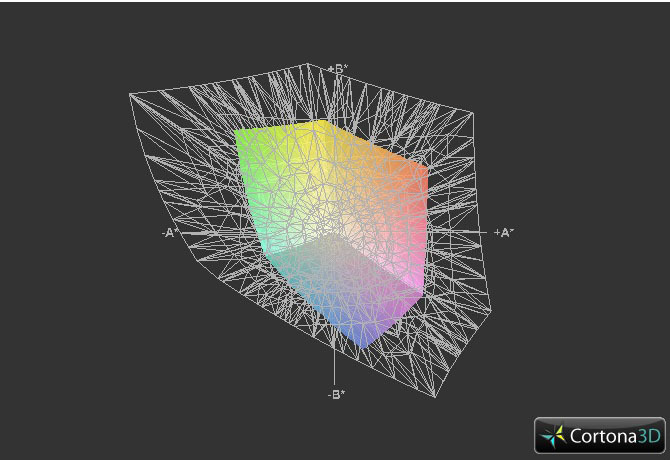 It becomes obvious that the covered color spectrum only complies with the standard when looking closer. 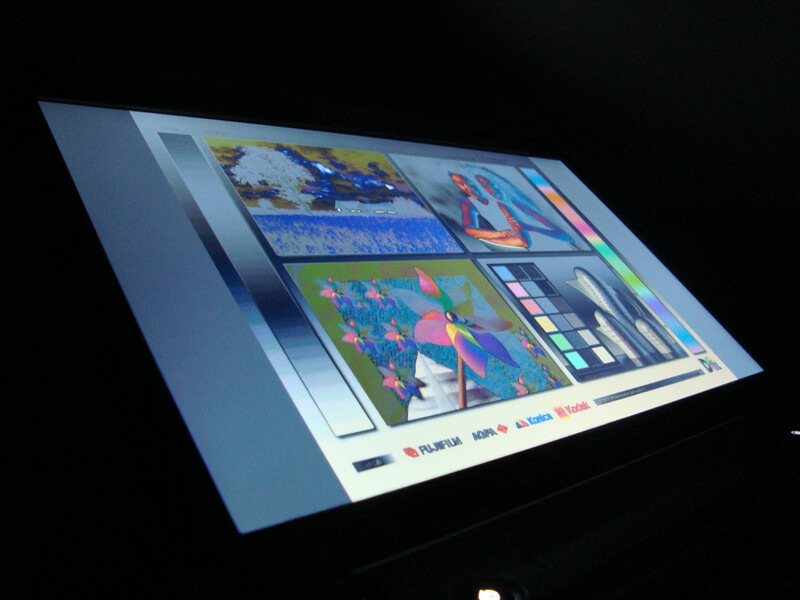 Thus, the installed Chi Mei N133B6-L02 screen has problems covering the sRGB color spectrum. Thus, the screen isn't suitable for high quality image editing. But the given spectrum is sufficient for the average user. 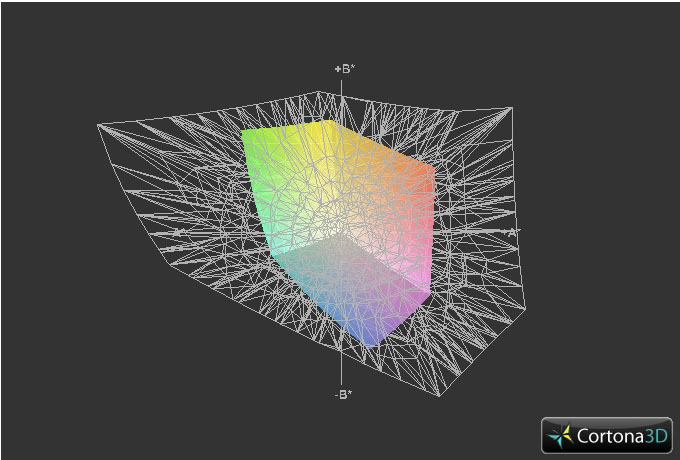 In view of display brightness, the IdeaPad Z360 positions itself in the center field with an average brightness of 192.4 cd/m2. In our opinion, the display's illumination could be a bit more even. We merely measure 170.3 cd/m2 in the lower center area, whilst the brightest spot of 210 cd/m2 is measured in the display's center. Additionally, the black value of 1.27 cd/m2 is a bit too high for our taste and the contrast of 165:1 is considerably too weak. 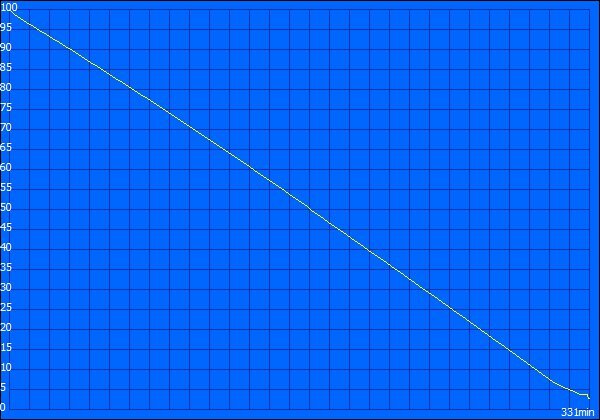 In terms of viewing angle stability, the horizontal viewing angle is a bit more obliging and stable than on the vertical plane. Viz. that the horizontal viewing angle can be set a bit flatter without color changes, as dimmed areas on the display, turning up right away. The vertical viewing angle reacts a bit more sensitive to changes, like e.g. sitting height or display tilt. 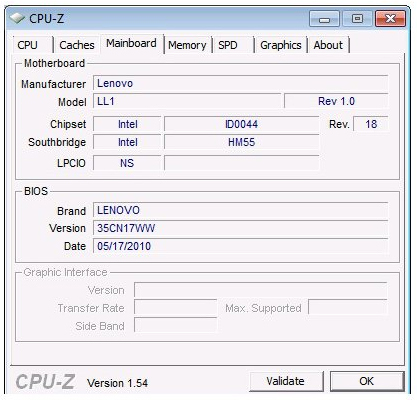 The Lenovo IdeaPad Z360 tested by us has a Core i5 520M processor from Intel. This is an dual core CPU optimized for use in notebooks. 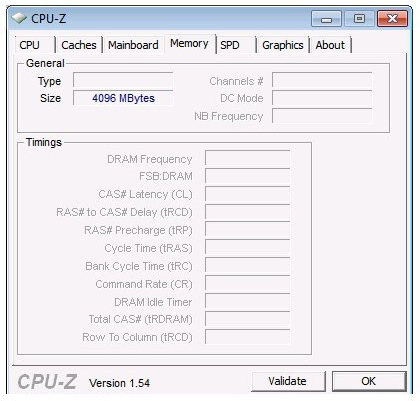 It has a native clock rate of 2.4 GHz. 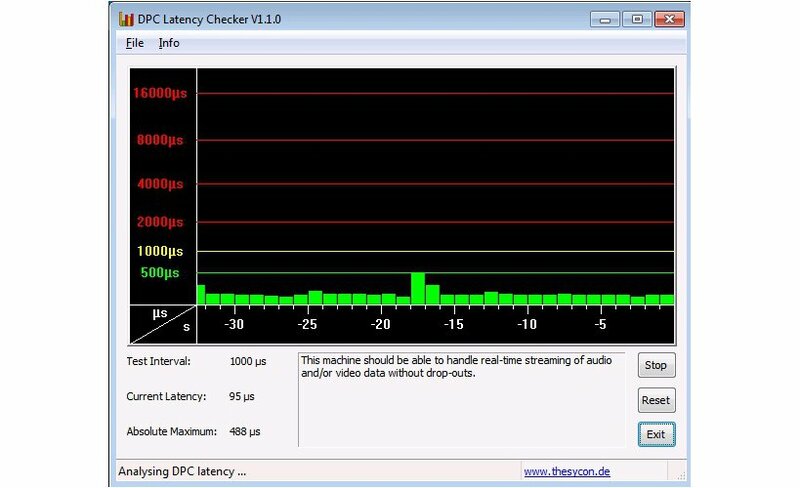 Overclocking up to 2.9 GHz is possible, depending on the load, due to the Turbo Boost feature. 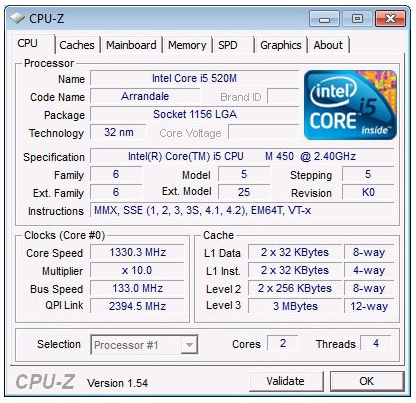 The CPU's manufacturer states a TDP of 35 watts for the Core i5 520M. Both cores can process four threads at once due to Hyperthreading technology, because every physical core is supported by a virtual core. 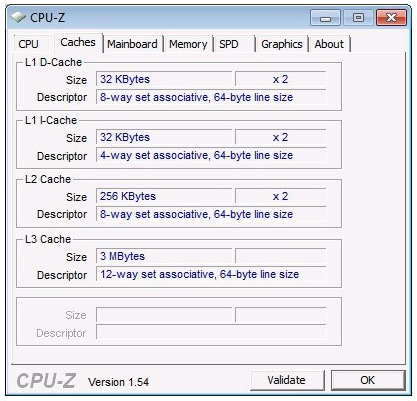 A feature of the new dual core CPUs from Intel is the implementation of the memory controller and an integrated graphics card (GMA HD) in the bundle. This allows a combination with a dedicated Nvidia 310M graphics card. Thus, the IdeaPad Z360 additionally has an Nvidia GeForce 310M GPU, which can provide you with a bit more performance, beside Intel's integrated Graphics Media Accelerator HD (GMA HD) graphics card. 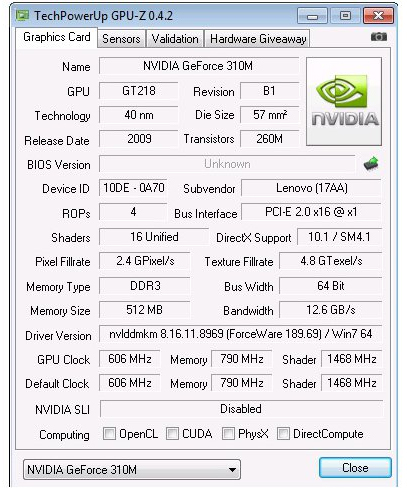 Due to Nvidia's Optimus technology, the test device is able to switch between both graphics cards on the fly absolutely autonomous and without having to reboot the system. Either the weaker, but in return more battery sparing, onboard graphics solution, Intel's GMA HD, or Nvidia's somewhat stronger GPU is used depending on the application. The settings for this can be found in Nvidia's driver software. A predefined list is also installed in the driver by the manufacturer. So programs, such as the 3DMark benchmark range, are already included in the list, just like the one or other game. Apart from that, it is naturally also possible to force the start with the dedicated GPU. The IdeaPad Z360 has more than enough performance reserves to manage well in everyday use due to the Core i5 520M. Internet surfing, writing emails, office applications or playing multimedia files aren't a problem for our test candidate. 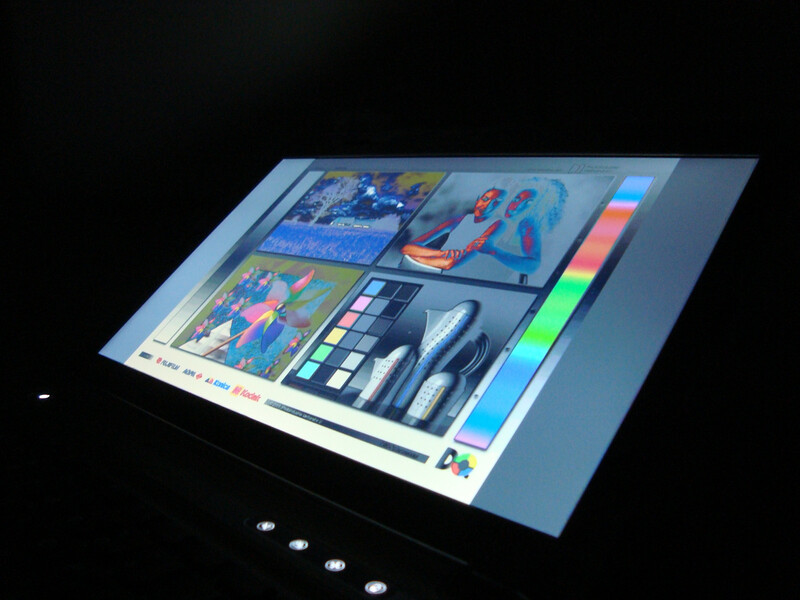 The only restriction is graphic intensive applications, such as computer games. The Lenovo IdeaPad Z360 is only suitable for gaming to an extent even with an enabled Geforce 310M. The performance given by the graphics card, located in the low budget sector, is unfortunately too weak. The performance could be sufficient for older games, as you can see in our gaming list. 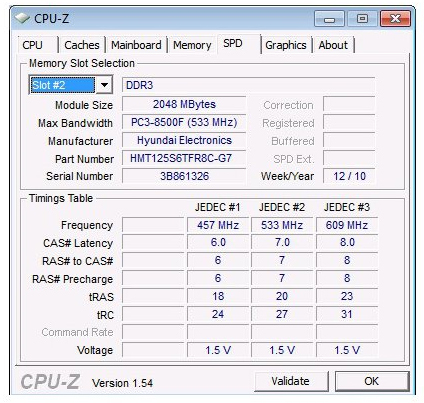 Aside the Core i5 520M, Intel GMA HD and GeForce 310M GPU, there is also a total of four GB DDR3 RAM from Hyundai Electronics onboard. The installed Hitachi Travelstar HTS545050B9A300 hard disk has a generous gross capacity of 500 gigabytes and rotates with 5400 rpm. 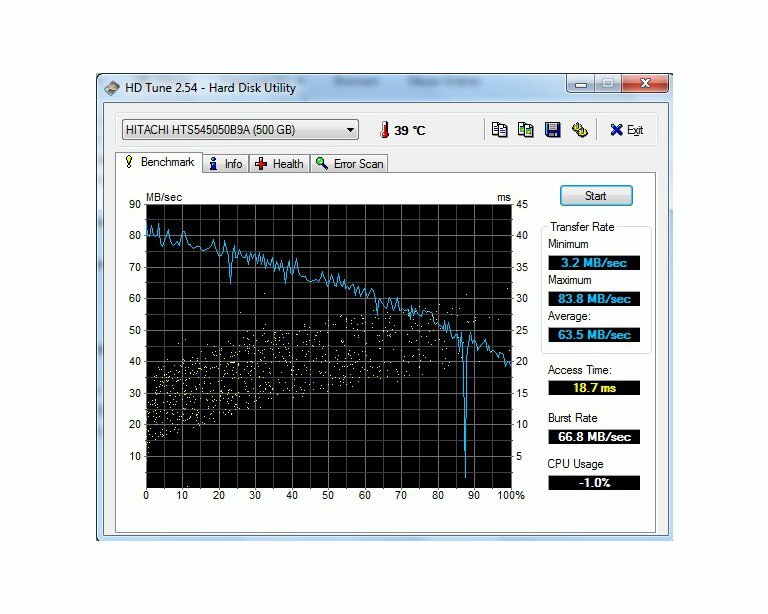 The recorded transfer rates and access rates, established with HDTune, are within the expected average range. The next point of our review deals with the IdeaPad /360's fan behavior and noise development, both in an idle state and under load. In idle, respectively office mode, the test device was very quiet and hardly audible. Our measuring instrument confirmed this with an average of 31.5 dB(A). Thus, the device is very suitable even for more quiet work surroundings, such as an auditorium, without attracting negative attention right away. The frequency with which the fan operates is within a subjectively pleasant range and we didn't find it annoying. The fan's average noise level under load is also impressive with 37.6 dB(A). However, there are the occasional outliers of 42.8 dB(A), which can be heard very clearly. As far as the Lenovo IdeaPad Z360's operating temperatures are concerned, we haven't anything to complain about in idle mode. 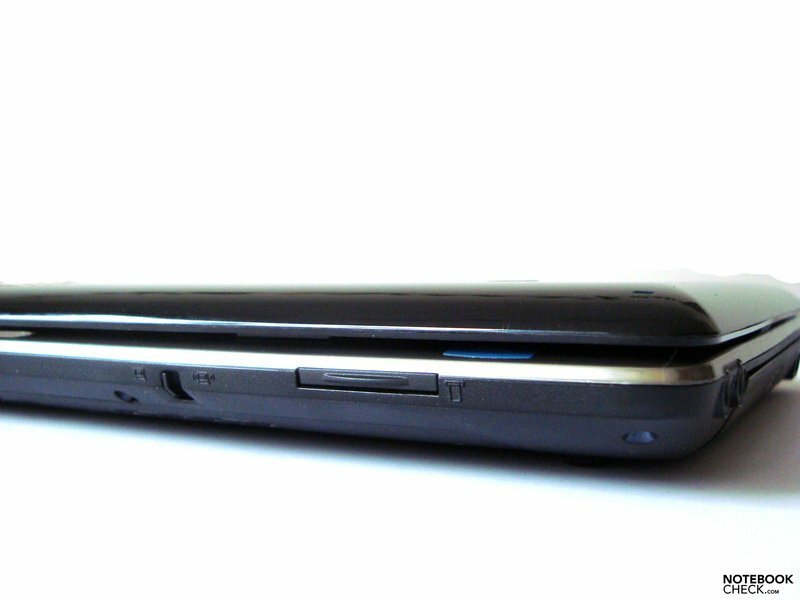 Both the keyboard, as well as the wrist-rest, respectively the case's bottom is within an acceptable range. The maximum rates we measured were merely 34.5 degrees Celsius in the touchpad area and 37.8 degrees Celsius on the bottom. These temperatures are very satisfactory and have to be described as still pleasant. Working on the lap shouldn't be a problem in office mode. 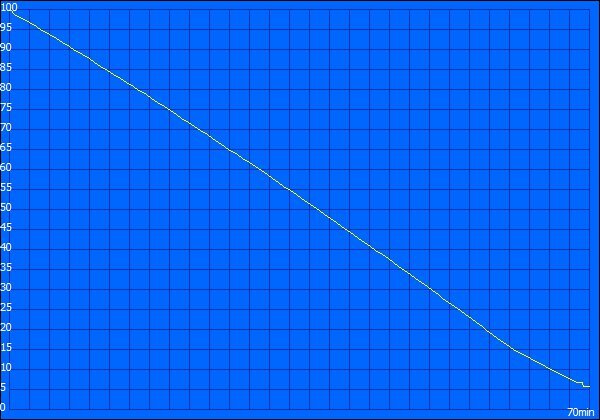 The temperature of 48.9 degrees Celsius, which we determined on the bottom, is a bit too high in view of the configuration. All measurements were taken at an ambient temperature of 22.5 degrees Celsius. (±) The average temperature for the upper side under maximal load is 36.8 °C / 98 F, compared to the average of 30.7 °C / 87 F for the devices in the class Subnotebook. 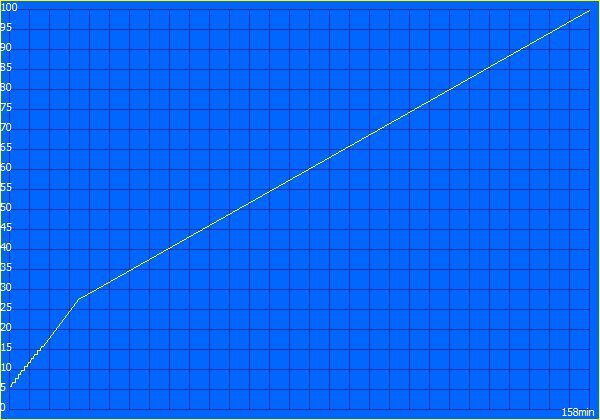 (±) The maximum temperature on the upper side is 40.1 °C / 104 F, compared to the average of 35.8 °C / 96 F, ranging from 22 to 57 °C for the class Subnotebook. (-) The average temperature of the palmrest area of similar devices was 28.6 °C / 83.5 F (-9.3 °C / -16.7 F). 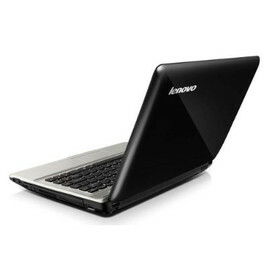 The Lenovo IdeaPad Z360's loudspeakers are very easy to locate. They are on the left and right, directly below the hinges. Both loudspeakers have turned out quite small, but do a good job for their size. The sound quality is surprisingly good in maximum volume and the output is also more than sufficient. The speakers don't overmodulate, which usually results in an unpleasant booming. Even if the sound is clean and clear, they sound slightly tinny. 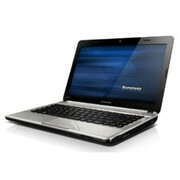 The bass supplied, as in most notebooks of this price category without subwoofer, is rather thin and modest. This can be easily compensated with a suitable, external sound system, like the home stereo system or even by a pair of high quality headphones. 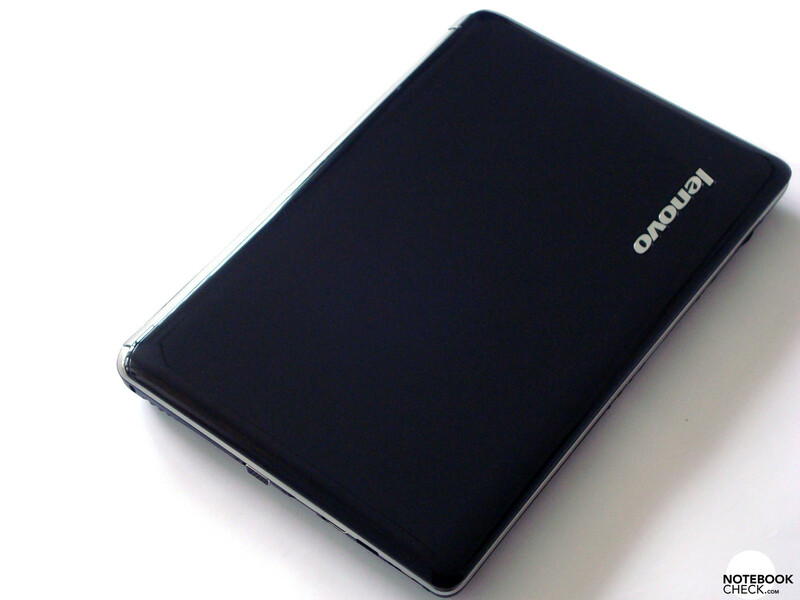 The IdeaPad Z360 is delivered with a lithium ion battery with a capacity of 48 Wh. To test the maximum and minimum battery life, we once again used the well tried BatteryEater tool. Our first run, with BatteryEater in Classic mode, resulted in a modest 70 minutes with energy options set to "high performance". 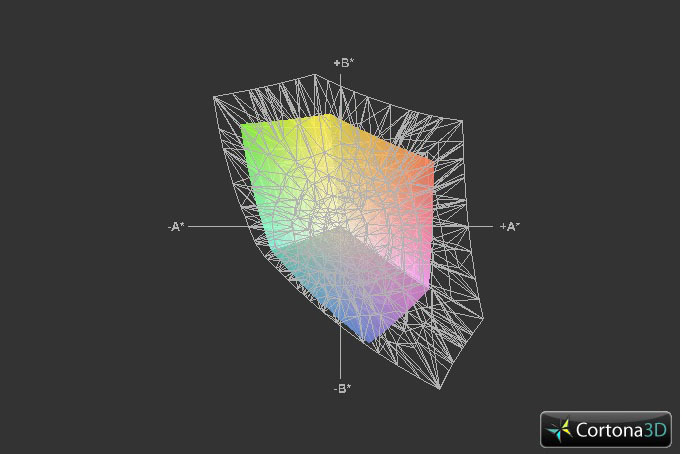 (OpenGL calculation) Devices like WLAN and Bluetooth were enabled and the test was also executed with maximum display brightness. In return, the maximum runtime was determined with BatteryEater's Reader's mode. Here, WLAN and Bluetooth modules were disabled and the display brightness was reduced to minimum. At least we could achieve 331 minutes with a full battery in the energy option "Super Energy Saver" mode. That corresponds to five hours and 31 minutes. The Lenovo IdeaPad Z360 stops playing a standard DVD after 164 minutes (two hours, 44 minutes) on average. Thus, an overlength movie should easily come to its end. It also calls for the mains again after an impressive 302 minutes of surfing through the internet via WLAN. That is, after all, five hours and two minutes of mobile freedom. 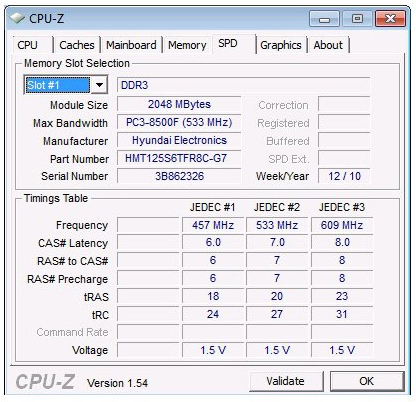 In terms of power consumption, the measured rates are within the expected range in idle mode. 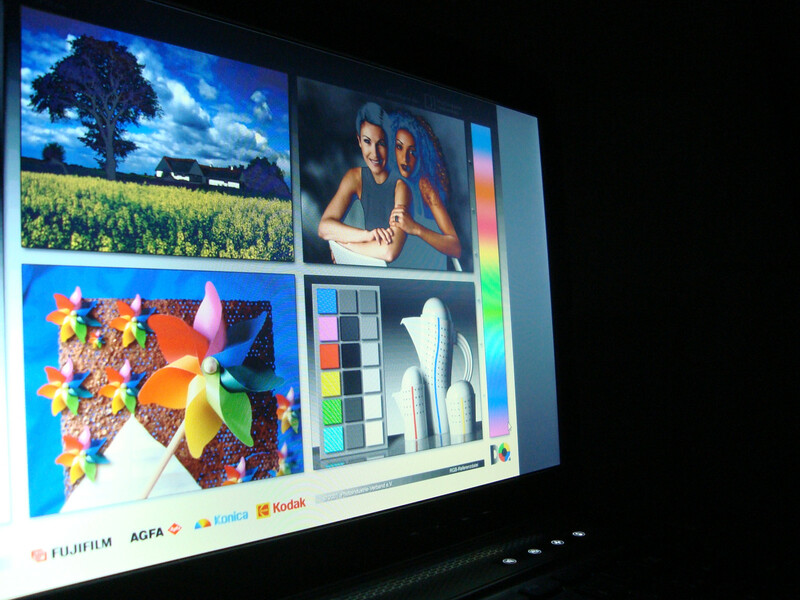 They relate to the Intel GMA HD onboard graphics solution. 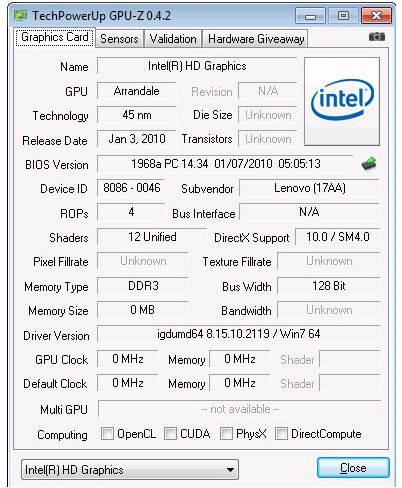 In return, the Nvidia GeForce 310M was used as the active graphics card for measuring the power consumption under load. It represents the stronger graphics card. 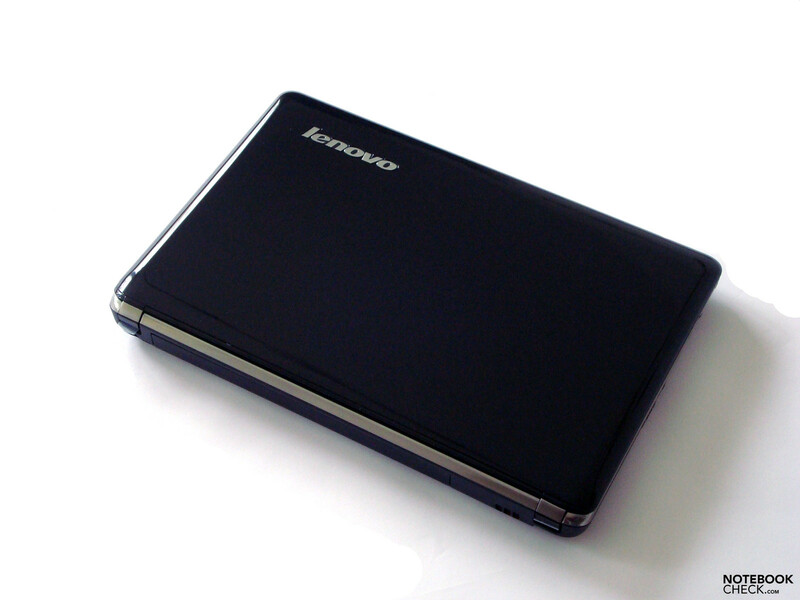 The 13.3 inch sized IdeaPad Z360 from the well-known manufacturer, Lenovo, has sufficient performance reserves to keep up with larger 15 and 17 inch notebooks, despite its handy size. Routine applications, as internet surfing, office application or playing multimedia content provide, isn't a problem for our test candidate due to the strong Core i5 520M processor. 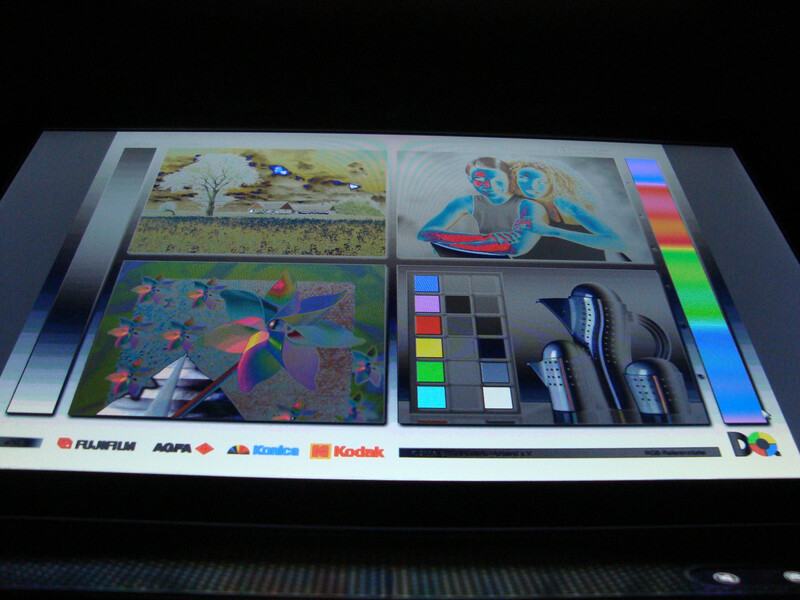 Since the IdeaPad Z360 Series isn't made for graphic intensive programs, like games, it quickly reaches its limits. If you want to occasionally treat yourself to a game, you should take a device with a stronger graphics card. The GMA HD's, respectively Geforce 310M's performance is sufficient for smooth rendering of movies and HD content in any case. 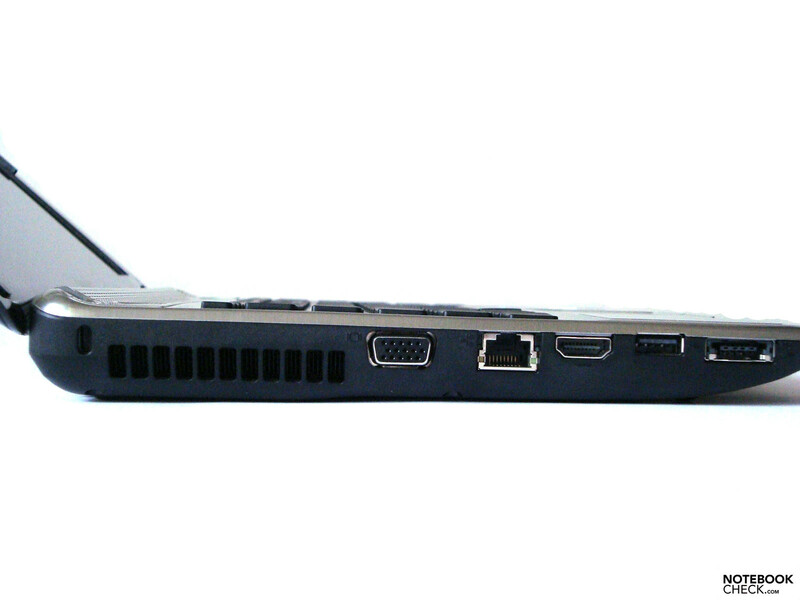 The bundle is rounded off by a multitude of interfaces, such as three USBs, HDMI, eSATA and LAN. Of course a webcam, WLAN and Bluetooth 2.1 have been included. We were especially pleased about the comfortable chiclet keyboard, both in view of looks as well as functionality. 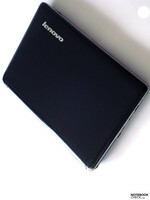 However, Lenovo has permitted itself to make a few slip-ups, such as in port distribution or also in terms of the homogeneity of brightness distribution. 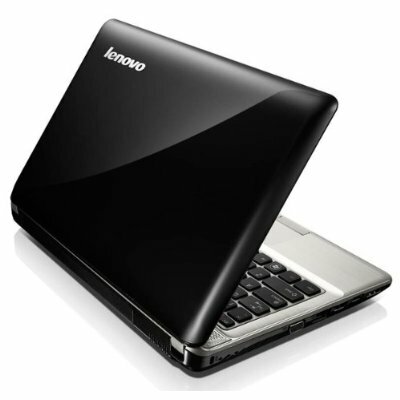 The manufacturer grants a warranty period of 24 months when a Lenovo Z360 is purchased. All in all, we can say that the Lenovo Z360 is aver very good mobile notebook that also has enough power onboard for multimedia content. Typing and working on the 13.3 inch notebook was a very pleasant experience. A stronger graphics card. The performance difference to currently installed GPUs is too slight to make a significant difference when switching to the "stronger" GPU. 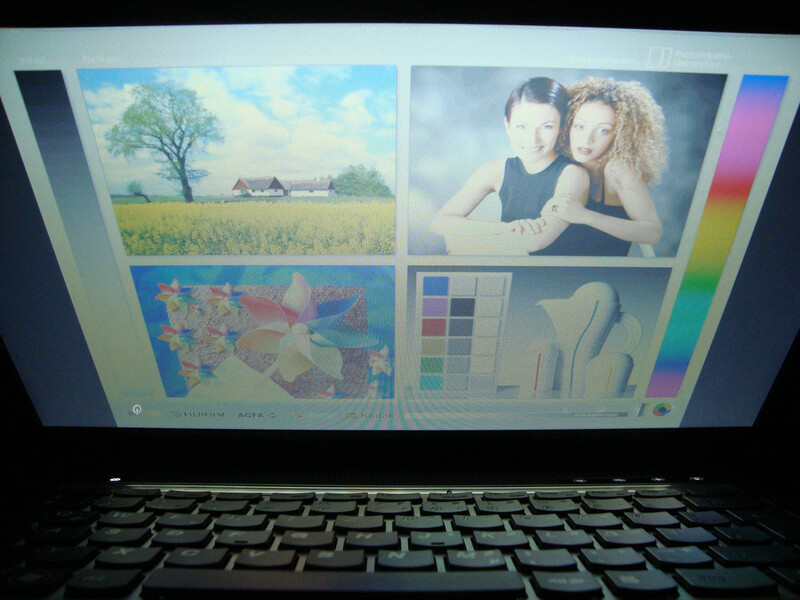 13.3 inch notebook + good, comfortable keyboard + good workmanship + good battery life + fair price = thumbs up. 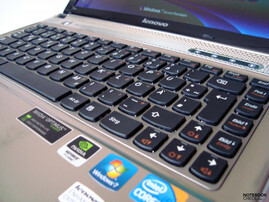 The Asus PL30JT-RO030X would be an alternative to the IdeaPad Z360. The Acer TravelMate 8372TG or the Dell Vostro 3300 could also be a competitor, but with a matt display.